On February 10, the Virginia House of Delegates passed a bill that would allow the Commonwealth to use the electric chair for executions when lethal injection drugs are not available. The Virginia Senate will now decide whether or not to pass this bill. According to the Associated Press, a similar bill was notpassed by the Virginia Senate two years ago. Virginia’s next execution, of convicted murderer Rickie Gray, is scheduled for March 16, 2016. Apparently, Virginia does not have enough pentobarbital, the first of three drugs administered, remaining to carry out the execution. However, if passed, the law would not go into effect for Gray’s March execution. Other states, such as Tennessee and Utah, have approved similar bills in recent years. Dale Brumfield, an author and digital archaeologist from Doswell, Virginia, wrote an interesting op-ed in opposition to this bill. Brumfield tells of law #398, passed in 1908, which eliminated the death penalty by public hanging, instead requiring death sentences to be carried out by electric chair in the basement of the State penitentiary in Richmond. At the time, this was a very progressive law. 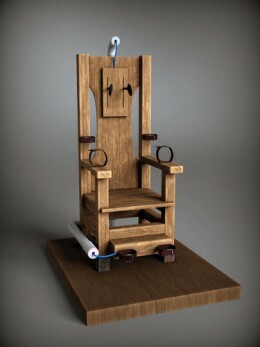 However, since then, there have been several instances in which the electric chair has failed, including the time that two cycles of electricity did not kill Derick Lynn Peterson on August 22, 1991.